What's the biggest corporation that calls your state home? 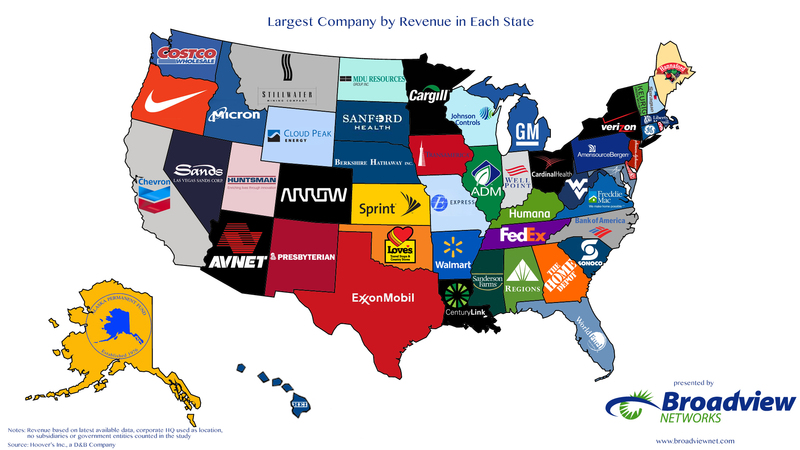 A new map created by the telecommunications company Broadview Networks allows us to visualize the largest companies by revenue in every state. Broadview based its map on revenue information from a Hoover's database of company profiles, and used the location of each company's corporate headquarters to determine which businesses "belonged" to which states. "We noticed that many states did not have companies included in the [Fortune 500] list, so we decided to perform our own research to find the largest company by revenue in each state based on the location of the corporate headquarters," wrote Russ Fordyce, a managing director at Broadview, in a Tuesday blog post about the map. Many of the results are pretty intuitive. There's Walmart in Arkansas, General Motors in Michigan and Exxon Mobil in Texas. But in some states, especially the smaller ones, you'll notice some surprising corporate heavyweights. Johnson & Johnson rules in New Jersey, while CVS is the big fish in Rhode Island's little pond. Additionally, in the state of Washington, it turns out Costco trumps Microsoft. You can check out an exhaustive list of the companies, their revenues and their locations here. Correction: Boeing's corporate headquarters are in Chicago. An earlier version of this story incorrectly suggested that Boeing was still headquartered in Washington state.